The pick and roll remains a very effective offensive weapon when run correctly. Years ago, John Stockton and Karl Malone of the Utah Jazz almost made it into an art form. An important point that many coaches fail to appreciate... do not run a high pick and roll play with less than 7-8 seconds left on the clock. If you do, the defense can jump out on the ball, forcing the ball away from the hoop as precious seconds are lost, and usually you end up getting a poor shot or no shot at all. 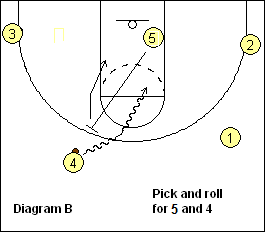 This play gives us several options and has the option of even running two pick and rolls. 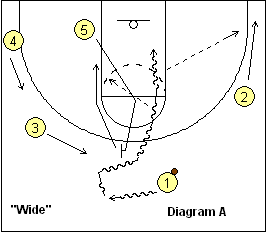 We can run this play out of any set offense, just give it a name and call it out. We can run it to either side, and the initial direction of the first screen determines which side. Diagram A shows our wings O2 and O3 starting down near the corners. Post players are O4 and O5, and since the elbow shot is an option, the post player starting low (here O5) is your better shooter. O4 comes out just above the arc and sets a solid screen for O1. We don't want this too high (or too low)... spacing is important. O4 must have his feet set and body still to avoid an illegal screen call. 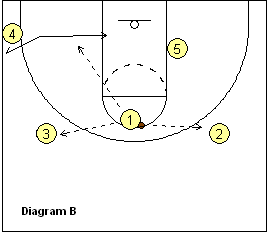 O1 dribbles tightly (shoulder to shoulder) around the pick and O4 rolls to the hoop. O5 cuts up to the elbow. O1 has the option of the dribble-drive to the hoop (diagram A), and possible kick-out pass to O2 in the corner (if X2 is helping inside). Or, O1 can pass to O4 rolling to the hoop (diagram B). If O4 is not open, O1 can pass to O5 who has cut up to the elbow (diagram D). Here, O5 can shoot the elbow shot, shot-fake and dribble-drive the left side of the lane, or pass inside to O4 ducking inside (posting up). 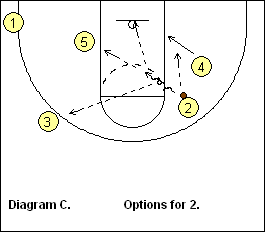 The next options are O5 running the pick and roll with the wing O3. 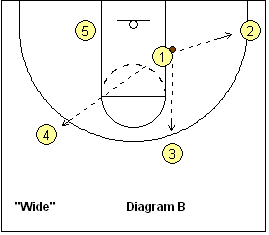 We can do this by having O5 dribble toward O3 and use a dribble - hand-off, and then O5 rolls to the hoop (diagram E). Alternately, O5 can simply pass out to O3, and follow the pass and screen for O3 and run the pick and roll (diagram F). O3 has the options of getting the shot or lay-up off the screen, passing to O5 on the roll cut, or perhaps a kick-out pass to O2 or O1 for the outside shot. We start in a 4-out set with the four perimeter players up high and with O5 on the opposite low block. As O1 dribbles the ball into the forecourt, O3 screens for O4, while O1 passes to O2 and cuts through (looking for a return pass from O2). If that pass is not open, O1 cuts through to the opposite corner. 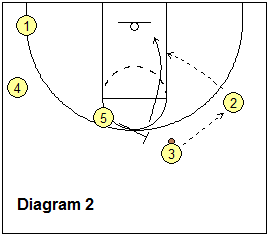 O4 sprints over and ball-screens for O2 (diagram B), and now O2 and O4 run the pick and roll play. O2 has several options (diagram C)... score (lay-up or pull-up jump-shot), pass to O4 rolling inside, a dump-pass inside to O5 on the opposite block, or a kickout pass to O3 for a possible 3-point shot. Similar to "42" above, but this time we'll run the pick and roll on the left side. 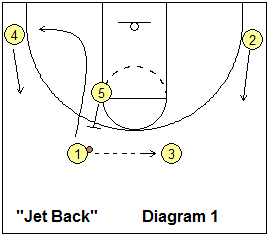 We start with the same high 4-out set with the four perimeter players up high and with O5 on the opposite low block. This time, O1 passes to O4 and cuts through to the right corner, and O5 re-locates to the right low block. Meanwhile, O4 passes to O3 and follows the pass and ball-screens for O3. Now we have O3 and O4 running the pick and roll on the left side (diagram B). Notice the good spacing with O1, O2 and O5 all on the opposite side. Now O3 has the options of scoring, passing to O4 rolling inside, or to O5 on the opposite block, or to O2 or a 3-point shot. 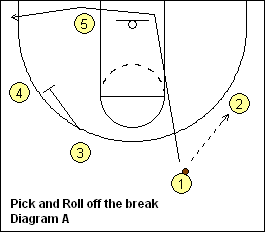 Here's another high pick and roll play that we can run off the break. O2 and O4 run their usual wide cuts up the court to the corners (diagram A). O3 is the inbounder and trails the break. 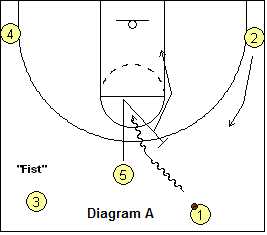 Usually we have O5 sprint to the weakside low block, but in "Fist", once he/she gets to the free-throw line, he stops quickly, plants his foot and goes back up high and ball-screens for O1. O1 and O5 run the pick and roll play. Diagram B shows options... O1 could drive for the lay-up, or pass to O5 rolling inside, or to O2 or O3 spotting up for 3-point shots, or to O4 back-cutting to the hoop. 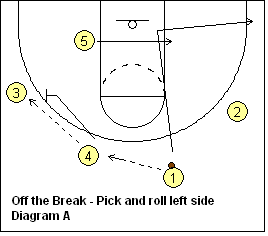 Off the Break - "Wide-51"
Sometimes the top X1 defender will overplay O1 and force O1 to his/her left. 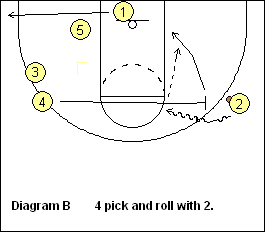 Or we may want O1 to be able to attack on the high pick and roll with a right handed dribble. No problem... just run "Wide-51". O1 dribbles left and O5 sprints up and ball-screens for O1 while our perimeter players are all "wide" on the 3-point arc with O2 dropping down to the right corner. O1 and O5 run the high pick and roll. As O1 dribbles around the screen, O3 and O4 fill up and over as seen in diagram B. O1 looks to score or pass to O5 inside. Other excellent 3-point options are to O2 in the corner, O3 and O4. O3, in the "safety" position (Read and React terminology), is almost always wide open for a kick-back pass and 3-point shot. 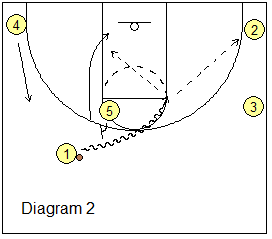 As O1 dribbles across half-court, O4 flare-screens for O3 (or this could just be a simple exchange if the defenders are sagging inside), and O4 moves up to receive the pass from O1. 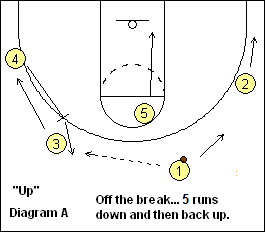 O5 sprints "up" and ball-screens for O4, and now O5 and O4 run the high pick and roll. Notice that after passing to O4, O1 moves off to the right to afford better spacing for the pick and roll. 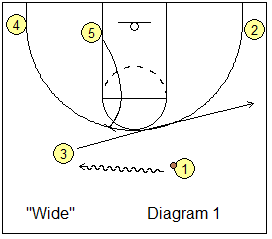 This play comes from coach Roy Rana and is a good last second quick hitter. In diagram 1 below, O1 dribbles to the top left as O3 cuts very wide, almost to the sideline itself (in order to really spread out the defense). O2 and O4 are deep in the corners and O5 starts on the left block. O5 moves up and sets a high ball-screen for O1 (diagram 2). 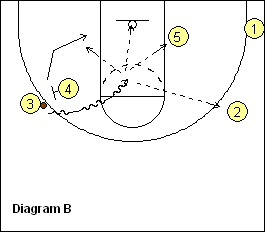 O1 attacks the ball-screen and we run the pick and roll with O1 and O5. O4 slides up to the wing. If the X1 defender slides under the ball-screen, you can then have O5 turn ("twist"), and re-screen for O1. 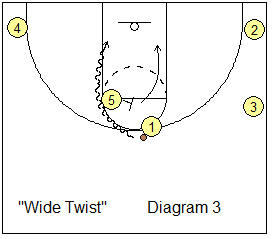 O1 reverses direction and attacks the ball-screen. This option is called "Wide Twist".